My fifth ground of 2015 was on Saturday 4th April at Woodstock Park in Sittingbourne, Kent. 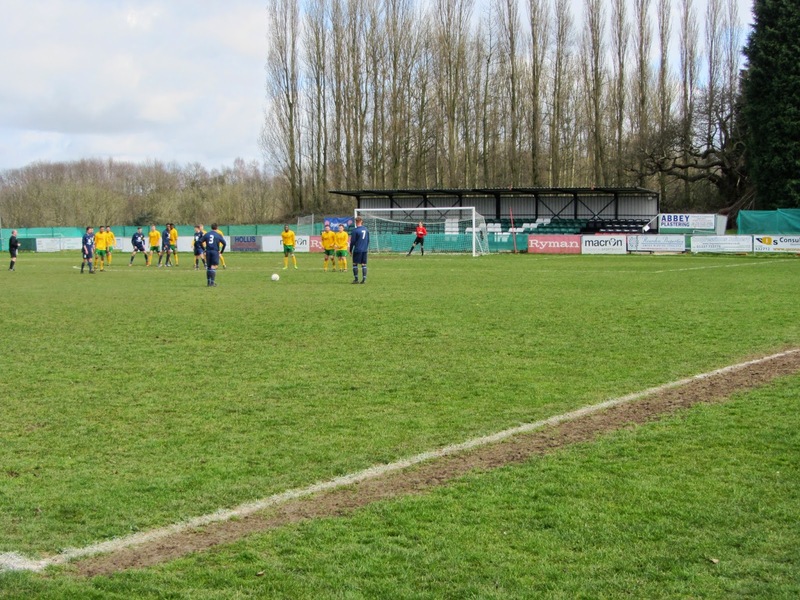 The match was Woodstock Sports vs. Holmesdale in the Southern Counties East League. Woodstock Park is on the edge of Kent Science Park, to the south of Sittingbourne. The venue is mostly surrounded by fields with only the south-west side backing onto the Science Park itself. It is around 2.5 miles from Sittingbourne railway station. The club moved to the ground in 2010 and played there until folding in the summer of 2015. In 2013 Sittingbourne FC relocated to Woodstock Park and are now the sole tenants. There is a large clubhouse on the south-west side of Woodstock Park - this building contains club offices, dressing rooms and two bars. There are a number of benches placed in front of this for fans to sit and watch the game. The rest of this side of the ground is uncovered standing except for one covered concrete standing area in the north-west corner. The north-east side of the pitch has no spectator areas though it is where the two dugouts have been placed. Behind the goal at the north-west end there is a small covered metal terrace while the only all-seater stand is behind the goal at the south-east end. This 150 seat structure was added in 2013 just prior to Sittingbourne moving in and there is planning permission in place to extend the seating area in this part of the ground if needed. Woodstock came into the game comfortably ahead of Holmesdale in mid-table but were taken apart by the visitors in the opening 45 minutes. Holmesdale opened the scoring in the 8th minute when the ball broke to Benga Ogunseye on the edge of the box and was able to turn and unleash a 20 yard effort into the top corner. A couple of minutes later the visitors doubled the lead as Ogunseye again caused problems for the home defence before squaring for Michael McKenna to tap in on the line. In the 19th minute Holmesdale scored an easy 3rd as two defenders were left unmarked at a corner and Mark Axel reacted quickest to head home. Shortly before the break the visiting side extended their lead further when Woodstock lost the ball in the area and Michael McKenna was able to loop a shot into the top corner from 20 yards out. After a dreadful first half the hosts made it a more even second period though they did concede one more goal in the 69th minute as a ball over the top found Ogunseye who lofted the ball over the advancing keeper to complete the 5-0 rout.